Get an estimate now! Super fast service! View our expansive service area map. Always reliable and professional service. We’ll mow and edge your lawn to your requested height. You can choose to have your clipping recycled back into your lawn or bagged. We always clean up and take the debris with us. This can be arranged to be a weekly or bi-weekly service. 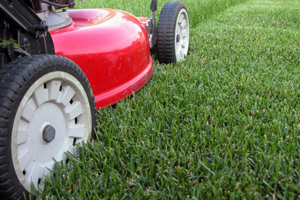 Our four-step yearly program offers a lush green lawn year round for an average 25% discount over our competitors. We supply and apply separate applications taking the guess work out of it for you. Thatch is the accumulation of grass stems and roots forming just above the surface of the soil. 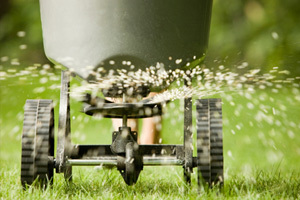 Dethatching helps remove this build-up so that your lawn requires less water and gets the nutrients it needs. 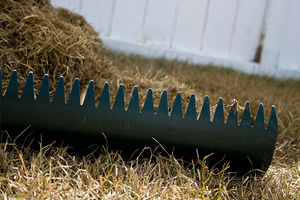 Lawn dethatching on a regular basis keeps your grass looking green and healthy.